SAN ANTONIO ? 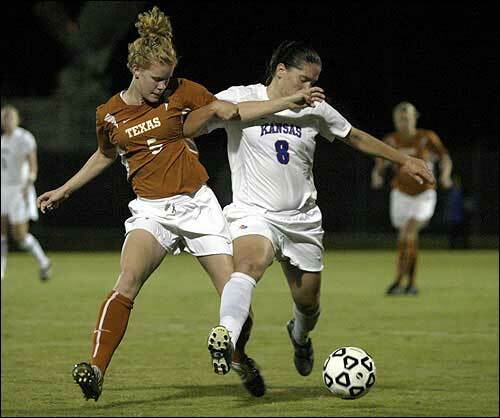 The Kansas University soccer squad found itself in familiar territory Friday, dropping a 3-2, double-overtime decision to Texas in the semifinals of the Big 12 Conference tournament. When the squads met Oct. 24 in Austin, Texas, the Longhorns edged the Jayhawks by virtue of a Kelly Wilson goal late in the second overtime period. Though it was Kelly McDonald who scored the game-winner Friday, Wilson set up the play. “It was like deja vu,” KU senior forward Monica Brothers said. Texas will face either Texas A&M or Colorado in the tournament championship match at 1 p.m. Sunday, while Kansas now will turn its attention to the NCAA Tournament. The selection show will air live at 2 p.m. Monday on ESPN News (Sunflower Broadband channel 141). Francis is sure of one thing, however: he’s glad his team won’t have to face Wilson again. Wilson, who leads the Longhorns in scoring with 14 goals and 13 assists, has recorded three goals against the Jayhawks and propelled Texas to a 9-0-1 all-time record against KU. Kansas University sophomore defender Holly Gault, left, boots the ball past Texas defender Paige Carmichael in the first half. The Jayhawks lost, 3-2 in double overtime, in the semifinals of the Big 12 Conference soccer tournament Friday in San Antonio. Kansas took a 1-0 lead with 14 minutes remaining in the first half. Senior midfielder Lauren Williams targeted forward Caroline Smith with her 25-yard free kick, and Smith headed it past Texas goalkeeper Alex Gagarin for her 11th goal of the season. Senior forward Rachel Gilfillan nearly made it 2-0 just 30 seconds later, dribbling across the face of the goal and unloading a quick shot, but Gagarin was there to make the save. Gilfillan pounced on the rebound and shot again, catching Gagarin off her line, but Longhorns center midfielder Nicole Breger cleared the ball off the goal line. The Jayhawks added to their lead in the 47th minute. Williams passed to Smith at the top of the 18-yard line, and Smith dished the ball off to Brothers. Brothers’ left-footed shot from about 14 yards back dropped over Gagarin’s shoulder for the score. Kansas University soccer players Kim Karfonta, left, and Jessica Smith watch during double overtime of KU's game against Texas. The Jayhawks lost, 3-2, in the semifinals of the Big 12 Conference tournament Friday in San Antonio. Ashley Foster put Texas on the scoreboard in the 70th minute after capitalizing on a rare mistake by Jayhawks keeper Meghan Miller. Wilson fed sophomore midfielder Amy Burlingham, who launched a long cross into the box where Foster was making her run. Miller came off her line to play the ball but mishandled it, and it dropped to Foster’s feet. Foster buried her shot in an empty net. Twelve minutes later, KU defender Nicole Cauzillo fouled Wilson on a breakaway inside the penalty area, and Wilson converted the penalty kick to knot the score at 2-2. KU's Holly Gault, right, tangles with Texas' Shannon Labhart. Gilfillan had the chance to put the game away seven minutes into the first 10-minute period of sudden-death overtime when Smith found her unmarked inside the 18, but her shot sailed just over the crossbar. McDonald nabbed the game-winner and her seventh goal of the season 112 minutes after the opening whistle off assists from Wilson and Nikki Thaden.